If you're like me who like squid only when its presented certain ways, then maybe this no-fuss way I cook it is something you'd like. I just basically clean and chop any-sized squid and let it marinate in some Maggi Magic Sarap, salt and lots of pepper for two hours or more. Then before frying in only a little oil, I add some flour to the squid. Then I fry it till its cooked (around ten minutes). 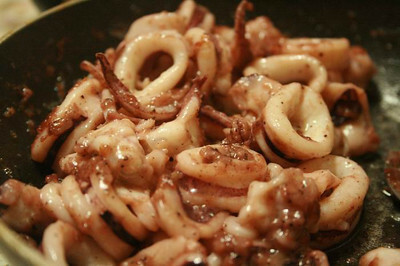 I don't like grilled squid as there's usually a bitter aftertaste or charred parts. This way, I get to enjoy the squid flavor and make sure I don't end up with tough squid. Enjoy!